This version of Eggy Bread is a great pancake replacement, i.e. you fancy American-style pancakes with maple syrup and so on but you are short on time. It’s dead easy and requires hardly any equipment, which is handy when it comes to washing up too. Phew. 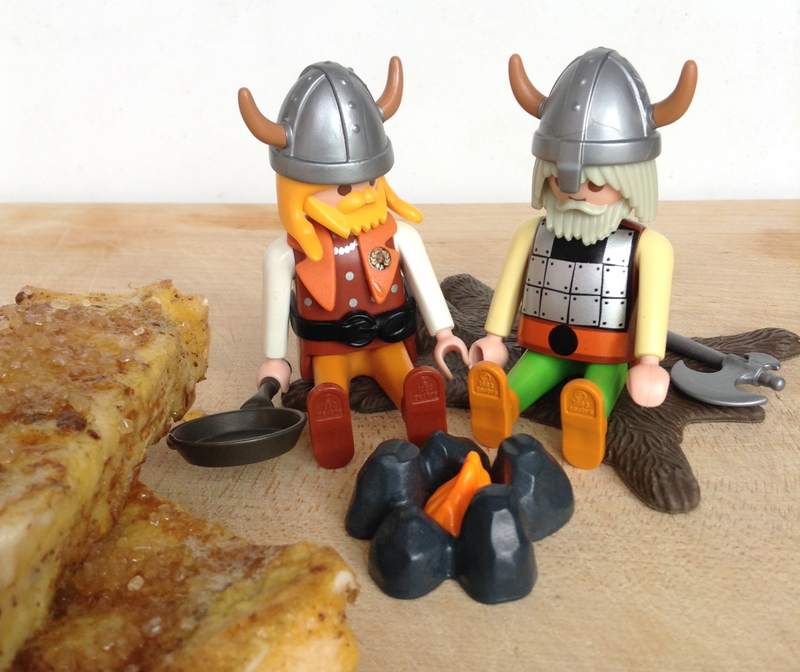 So, apart from enjoying my Cinnamon & Maple Syrup Eggy Bread and the glut of summer berries, we’ve been super-busy of late here at OH HQ. Decorating the sitting room has taken up several weekends, and in anticipation of finally getting our tip of a front garden sorted, I’ve become obsessed with paving… As my Pinterest followers will know! Anyway, here’s the recipe, so hoist the little one on your hip if needs be, and rest in the knowledge that even if you cannot put baby down, you can all still eat. Which will help. P.S. Note the mini Duralex glass in the below photo, with maple syrup in. Bought from the new Hema store in London! It’s AMAZING! Like Ikea but better. Whisk the egg and milk (if you have it, but it’s not essential) and some ground cinnamon in a mug. 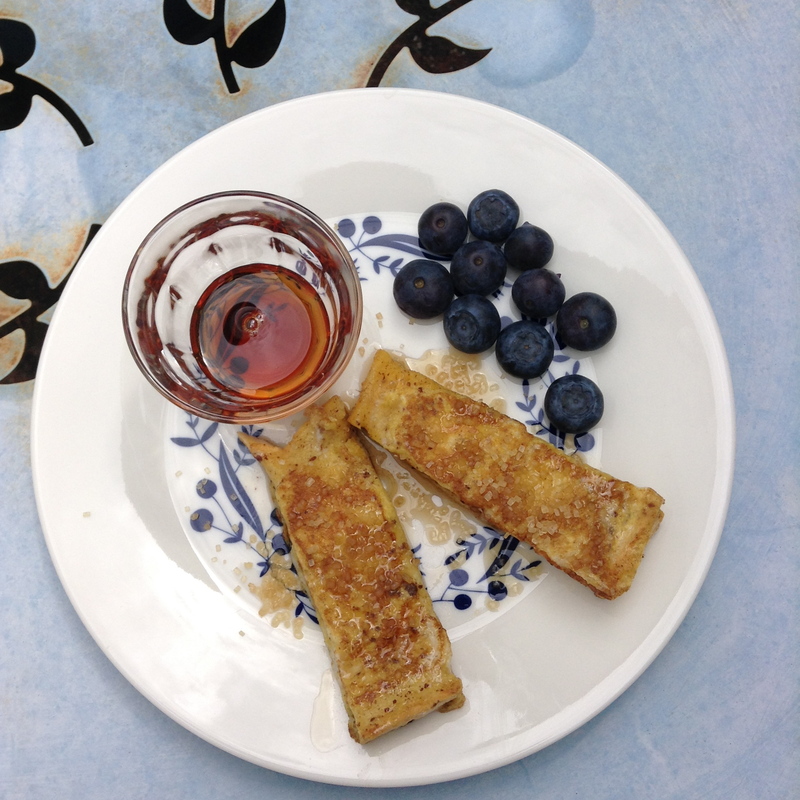 When nicely golden on both sides, serve your Eggy Bread strips with a sprinkling of Demerara sugar and a drizzle of maple syrup. Berries on the side are nice. As is a strong coffee. It’s thirsty work, being three! So, Littlest has started nursery school and has settled in a treat, thank goodness. She has got her little group of friends, old and new, and I hear about them every day, and the games they get up to. Because of work I don’t get to pick her up every day, but on the days I do collect her, I noticed she was very thirsty at the end of the session. She’s grown out of her Tommee Tippee beaker, but whenever I gave her a normal plastic water bottle, half of it would end up down her front. I needed a solution for my thirsty girl! Thanks to the lovely folks at Oxo Tot who make gorgeous colourful products, we have found the answer! 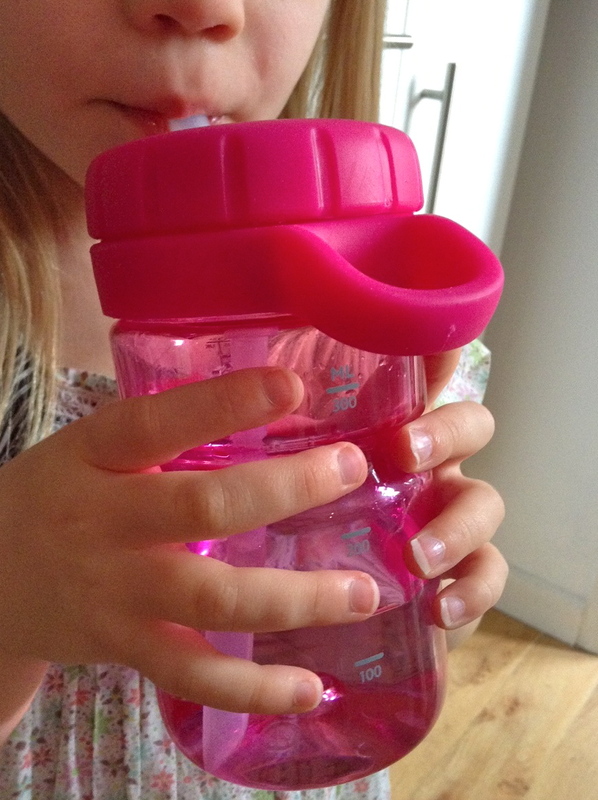 The all-new and super-stylish Twist Top Water Bottle – designed especially for children aged 2+. It’s just the right size, at 350ml, so it fits nicely into small hands. When you turn the top, the straw pops out – perfect. My little one cannot manage to twist the top herself though – I have to do that for her – but she can close it. The top is nicely rubberized, there is a handy carrying loop, it is leakproof (yes! ), easy to wash, and all in all is a good quality bit of kit – as you’d expect from this family-friendly brand. Those same lovely folks at Oxo Tot have given me three to give away on the blog – one in Aqua, one in Green and one in Raspberry! So, if you’d like to win one, please comment on this post. To be in with a chance of winning a Water Bottle, you have to a) follow @onehandedcook on Twitter AND b) RT my tweet about the giveaway! THE DEADLINE FOR ENTRIES HAS NOW PASSED AND THE WINNERS HAVE BEEN SELECTED! THANKS TO EVERYONE WHO ENTERED. With thanks to Oxo Tot UK for the prizes. You can follow them on Twitter here and on Facebook here. 2. The prize draw is open to any UK resident, aged 18 or over, who follows the @onehandedcook Twitter account AND retweets the tweet about the prize draw referencing the prize of an Oxo Tots Twist Top Water Bottle. 3. The competition ends at 09:00am on the 25th November 2013. 4. One winner will be drawn at random from all valid entries. 6. 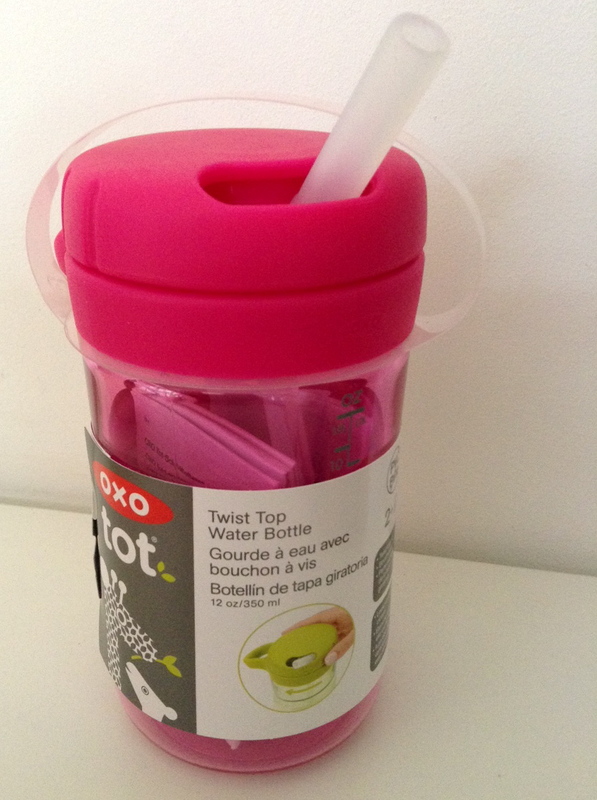 The prize is one Oxo Tots Twist Top Water Bottle. 8. The draw will be made by random selection within seven days of the competition ending and the prize posted to the winner’s home address within 30 days. 9. The winner will be notified by direct message on Twitter if they have won. 10. If a response is not received by the winner within 30 days they will forfeit their right to the prize. 12. This prize draw is in no way sponsored, endorsed or administered by, or associated with Twitter and Twitter shall not be liable in any way whatsoever to the Users. I am psychologically preparing myself for a bit of a strange one next week. For it will be the first time I will be away from both my children for a whole week. A whole week. It is half-term, and they are going to Granny and Grandad’s (well, actually not Granny, because she is Danish, and therefore she is known as Farmor – father’s mother – geddit?) while hub and I are staying in London. All parties are hugely looking forward to it. As for me, there is part of me that knows I am going to really really miss them, but also part of me that is elated and can’t wait to have a child-free week. We already have dinner booked one night, and cinema another, for example. But I know it will be strange without the Gruesome Twosome. One thing I will relish will be supermarket shopping on my own. No toddler to placate, no whining 6-year-old to buy tat for. Just little old me freewheelin’ down the aisles with a small trolley (sans child seat of course). So how did that day go? Well, once I’d finally got in the store and started shopping, he needed a nappy change half way round (of course) … which mean that I then started panicking about him getting hungry and screaming … by which time it was too late, so I just carried on shopping anyway, blindly throwing things in the trolley in a bid to get it done. Only for him to let rip and scream the place down as I tried to unload the trolley onto the conveyer belt, which the cashier kept moving along, making me even more stressed as I couldn’t keep up. Fast-forward a few years and it’s easier, but it’s still hard at times. Weirdly, I’ve never fully embraced the online shop, although I do do it very occasionally. I have friends who swear by it, but I dunno, I find it all a bit clinical. I quite like going out, seeing what’s new, browsing the books and DVD department (if possible), the wine aisle … So, here are my five top tips for getting round a supermarket with a toddler. Learnt the hard way, from bitter experience. Sorry, I mean happy times shared together. And if you have twins, and you take them to the supermarket, you deserve a medal. 1. Write a list, and – this is going to sound really crazy, but please stick with me as it WORKS (and I only recommend things that work, remember) – once you’ve written it, rewrite it and organize it according to the different zones or sections in the supermarket. So you’ve got your fruit and veg section, your meats and chilled foods section, your yogurt, milk and cheese section, your store cupboard section, bakery items, toiletries, baby, drinks, baking goods… etc. It will help preserve your sanity, I promise. 2. Before you begin, set a timer – either mentally or on your phone – you’ve got ONE HOUR to get it done (including the checkout). My motto, ‘get in quick, get out quick, nobody gets hurt.’ Nothing focuses the mind like a deadline. And with your mega-organised list you will be like Supermum getting round that store, I promise you. 3. Always, always, always get your toddler in the trolley before you go into the supermarket. And do up the safety belt thing. Always. 4. Take snacks. Take more snacks than you think you could ever possibly need – rice cakes, squeezy fruit pouches, boxes of raisins, etc. If you run out, go to the cheese counter and get hold of as many sample cubes as possible. Beg if necessary. 5. Don’t be afraid to ask for help. You are choosing to spend your money in their store (probably quite a lot of money), and supermarkets are all billing themselves as ‘family friendly’ these days, so get ‘em to practise what they preach. Say, ‘Please can someone help me pack the shopping?’ or if you’re in the queue, tell a member of staff ‘I’ve forgotten x, please can you get it for me?’. They always do for me! So speak up, get help, keep moving. 6. (I know this is number six.) Treat yourself to a nice coffee and a biscuit when you’ve finished. You’ve earned it! A steaming hot bowl of soup is, for me, the culinary equivalent of a big hug from someone wearing a Nordic Sarah-Lund-style jumper. Cosy. I love the ritual of making it – sautéing the onion, adding the vegetables, the stock, seasoning, simmering, stirring, ladling it into pre-warmed bowls (if I’m organised), and finally dipping my spoon in and devouring it, preferably with toast slathered in butter on the side. Luckily for me my family shares my love of soup, so Saturday lunch is more often than not soup for all; even when I was weaning the little ones, I’d just omit the salt and liquidize the soup in batches, leaving some as thicker purée, perfect for babies and toddlers. This soup is really easy, and a brilliant one to make in stages as there is a bit of prep involved (although you could always cheat and buy ready-prepared butternut squash – who’ll know?). Roasting the vegetables first is a bit different, but gives them a sweet, almost caramelized flavour, and the sweet potato gives the soup a silky smooth texture. Perfect for a chilly November or December day, and the sweetish flavour usually goes down very well with babies, toddlers and older children. It also freezes beautifully – hurrah. Why not make double? Peel and chop the squash, sweet potato and carrots when you have a 10-minute window of time, such as when baby is happily sitting in her bouncy chair, or having a nap. You can then put your pre-prepared veg in a container in the fridge, or on the side until you are ready to make your soup. If children happily occupied, carry on to the next stage. Line a decent-sized baking tray with foil (to save scrubbing it later – yay!) and add your pre-cut vegetables, then drizzle with olive oil and season. Add the rosemary, and toss the vegetables with your fingers. Roast the vegetables in the hot oven for around 30 mins, turning halfway. You want them to be soft. Remove from the oven, remove the rosemary sprig and set aside. Again, if at this stage you need to pause, you can. It doesn’t matter if the roasted veg go cold as you just reheat the soup at the end. Heat a dash of oil and a knob of butter in a heavy-based pan (I use a Le Creuset), and add the onion. Sauté over a medium to low heat for a good 10 minutes; you want the onion to be nice and soft. Stir occasionally. Blend your roasted vegetables, softened onion and stock together in a liquidizer. Reheat in the saucepan and serve.